The HARMAN Broadcast Team is always on the road and you’re invited to join us! Whether you need training, a sales demonstration or need to start researching your solution the HARMAN Broadcast Truck and team can bring it all to you. We can provide support for all types of broadcast solutions from a local control room, to a multi-continent infrastructure and all the way to a remote VR production workflow. Using the form below, submit a request to have us visit your facility. With factory experts on hand to show you around and work through your project needs and requirements, we can customize the truck to include the equipment you need and want to evaluate. 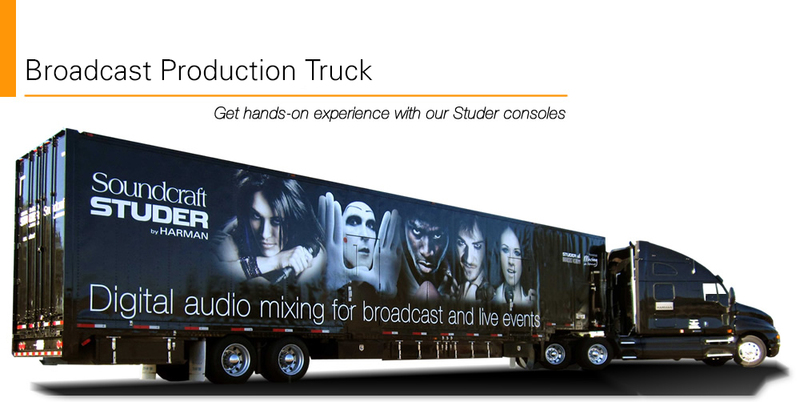 Want to do a test production with our truck? No problem! We can connect directly into your facility or workflow for a fully immersive real-time evaluation. Please don’t hesitate to contact us using the form below and start the conversation today.